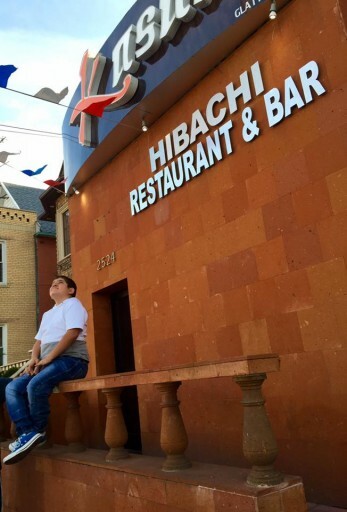 Ari Cohen who suffers from a rare genetic disorder, outside Kasai Restaurant in Brooklyn. Brooklyn, NY - What began as a one of a kind night out for a special needs South Florida boy and his family may have spawned a new trend in the kosher restaurant business, catering to others with disabilities. Leah Cohen, a Boca Raton mother of two, was hoping to include dinner at a restaurant on the itinerary for a family visit to New York to celebrate a niece’s bas mitzvah. 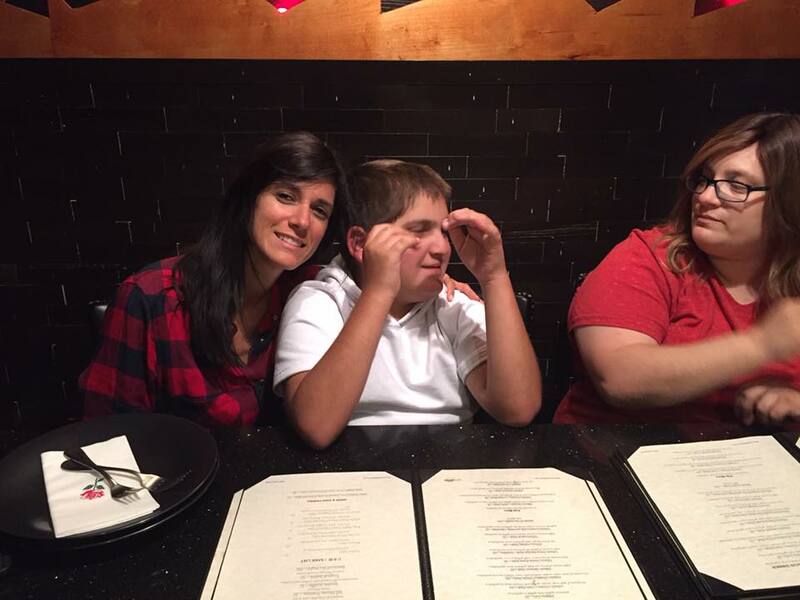 Because her 13 year old son Ari suffers from Trisomy 9 Mosaic, a rare genetic disorder, the family seldom goes out to eat because of the many difficulties they encounter. “One of Ari’s vocal chords is paralyzed so he doesn’t talk, he grunts and while he does have a device that talks for him it is very loud,” Mrs. Cohen told VIN News. A member of the Great Kosher Restaurant Foodies group on Facebook, Mrs. Cohen said she loves seeing the pictures of restaurant meals posted by others on social media. 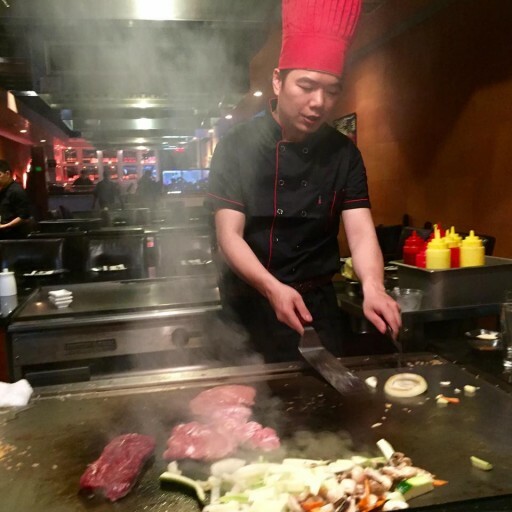 Posts about Kasai, a Brooklyn hibachi restaurant which turns meal preparation into table-side entertainment, were particularly intriguing. Mrs. Cohen contacted the group’s administrator, Elan Kornblum, asking him if he could find out if the restaurant would be willing to accommodate Ari’s special needs and gear. With more than 20,000 members in the Facebook group, Mrs. Cohen wasn’t sure that she would even get a response but within an hour the arrangements had all been made. The day before the Cohens’ planned to visit Kasai, Mrs. Cohen touched base with Victor Ebadi, the restaurant’s owner, to express her concerns that Ari might make other diners uncomfortable. When the Cohens got to Kasai on May 11th, waiters were at the ready, carrying Ari’s stroller into the restaurant, accommodating extra relatives who showed up unannounced and making sure that Ari had a steady supply of Snapple. Because Ari has difficulty chewing and Kasai has a limited children’s menu, the chefs prepared eggs for Ari at his request. Leah Cohen (L) with her son Ari inside Kasai Restaurant in Brooklyn. The night proved to be a resounding success. After getting back to Florida and sharing thoughts and pictures on the Facebook group as a thank you to Ebadi a few days later, Mrs. Cohen thought that the story of their night at Kasai was over. While group members began liking and sharing the post, other parents of children with special needs contacted Mrs. Cohen, telling her that they too had been subjected to disapproving looks when they dined out with their families. In addition to raising awareness to the difficulties of enjoying a night out with a special needs child, the Cohens’ experience struck a chord with many, becoming the most liked post in the group’s history. In a Facebook post written Wednesday morning, Kornblum said he had been contacted by numerous people and that he had spoken with Edabi to arrange another special needs evening at Kasai so that other children could enjoy both the antics and the menu at the restaurant. “If we can allow a special child to have a special night, to see the knife juggling, flame tossing, fire burning experience, then we’ve brought a little more joy into their world,” wrote Kornblum. Chef Sang preparing food for Ari at his request. Kornblum also announced the #foodieforward project, hoping to find additional kosher restaurants that would accommodate other families in similar situations. Within one day, Teaneck’s Doghouse had expressed interest in designating particular times for families with special needs children and Kornblum is planning to expand the project to kosher restaurants in other cities. Mrs. Cohen said that she is inordinately grateful for the opportunity to pay it forward. I'm sitting here and tearing up. Thanks you vosizneias forsharing this amazing article. And of course thanks to the restaurant for really going the extra 1000 miles. WOW!!!! Thank you to all those involved in this wonderful chesed. It is very difficult to go to any restaurant (even Pizza Shops) without encountering some issues. Please also post the hashgachos of these wonderful establishments.!!!! Beautiful...the story, the family, the cause, and Victor Ebadi. You can call any restaurant b4 visiting to get info on hashgacha. Posting it is not necessary and may also change sometimes. Wonderful! We are improved by making special efforts for special people. As someone being involved with these special neshomos who for unknown reasons are being given by hashem to their families to deal with, but actually these special neshomos belong to all of us who belong to klal Yisroel!!! Therefore I am delighted to see that finally they are getting the positive attention that they should be getting from every person they meet and every place they enter, may this be an eye opener and lead to a new beginning in our community, instead of crossing the street away from them we should be crossing the streets toward them to greet them and bring a smile to their faces!!! Thanks to the owner and management of the restaurant who will hopefully be the pioneers of the new beginning of the never ending chain reaction of this good deed!!! After all we are רחמנים בני רחמנים and this should bring our awareness to these special neshomos, with who we should have no problem having to sit at a table next to them or down the road at the same table and of course not having the need to open an hour earlier for them, and just make them part of Klal Yisroel who they really are. Of course, it will be nice when we reach a point that we don't need special times for those with special needs. When we don't avert our eyes, run away, or just hope for them to get out of there.